For the first time at mid price - one of the greatest opera recordings of all time, a tribute to the great swedish dramatic soprano, Birgit Nilsson, who died in 2006. Birgit Nilsson began singing the demanding title role of Strauss' opera shortly before this recording was made in 1966 - and reigned supreme in the role until her retirement from the operatic stage. This recording - a truly legendary set - has been definitive for almost forty years. The music of Richard Strauss was a constant feature of Sir Georg Solti's appearances in the concert hall and in the opera house and he recorded six of Strauss's operas for Decca, starting with Arabella through to the release of Die Frau ohne Schatten in 1992. 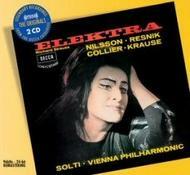 It was with the 1962 recording of Salome with Birgit Nilsson in the title role that Solti and The Vienna Philharmonic scored a resounding success [also available in Decca Originals on 475 7528] and the same forces assembled again in Vienna's Sofiensaal in 1967 to record Strauss's great expressionistic drama Elektra.